Alex Phillip, Supervisor of Elections, said on Wednesday that the decision by Government to change the referendum date has not affected the validity of the ballots, because no date was written on the ballots that will be used for the referendum. “Everything remains the same, as as there is no date on the ballots. What has changed is that there is now an extension of time, and with that comes the opening of registration of voters, so once we have more persons registering we will have to print more ballots,” he told journalists. “There are no changes to the Bills, and because the writ was revoked, we have to publish them again for public scrutiny. This is a requirement in law,” he explained. Phillip disclosed that 70,714 have been registered to participate in the 27 October 2016 referendum. However, with the Governor-General revoking the 27 October writ and naming 24 November as the new date for the referendum, it is expected that some persons who were not registered or who got registered after 4 October will have the opportunity to vote in November. The Police will be voting on 22 November 2016. “I want to assure all that we have printed ballots for all persons who are registered, so all should come out and vote, and once we have more persons registered we will print the required amount needed,” he said. Phillip also made a plea for more persons to come forward and register as observers. He said that although there are a lot of groups who have shown interest, there is still room for others to become observers. “During a general election, the party has agents whose task is to observe and make sure that the election is conducted in accordance with the regulations. These observers will be agents who will ensure that the referendum vote is done in accordance with rules,” he said. No individual person will be accepted as an observer, as the preference is for persons to represent groups and/or organisations. 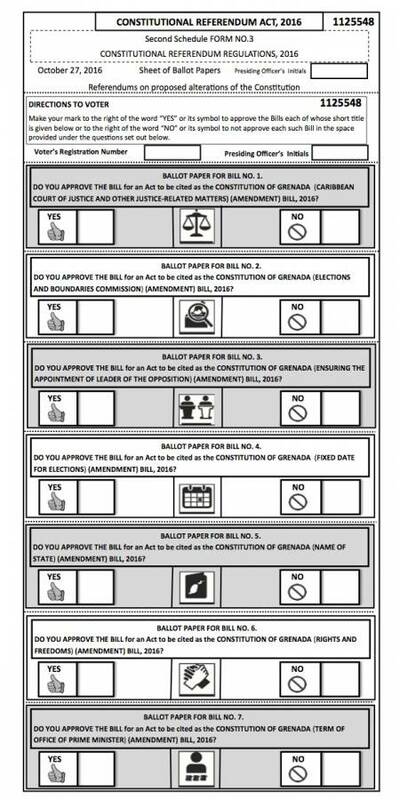 On Referendum Day, all registered electors will be entitled to vote ‘Yes’ or ‘No’ to the approval of each of the 7 Constitutional Amendment Bills as passed by the House of Representatives and the Senate.